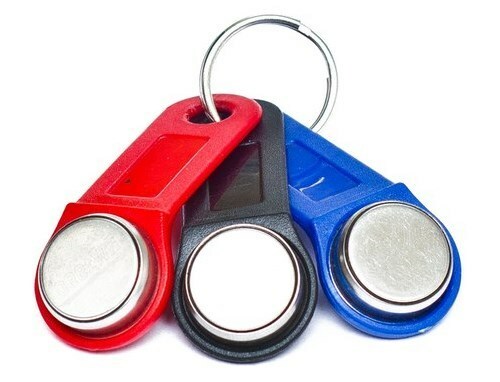 Using Arduino you can make at home a copy of the key, and the intercom 15 minutes, if, for example, the workshop closed and the key is needed urgently. Let's see how it's done. Each key for the intercom has its own room - this room serves as a key identifier. It was on the room key intercom solves your or someone else's. Therefore, the copy algorithm like this: first you need to know the number of "permitted" key and then assign this number to another key - clone. To intercom there is no difference, was applied to the original key or its copy. Checking the number against its database of allowed numbers, he opened the door. Keys for intercom, which we will connect to Arduino (sometimes called iButton or Touch Memory), is read and written via the 1-wire interface 1-wire. Therefore, the connection scheme is very simple. We need a couple of wires and a pull-up resistor of 2.2 kOhm. The scheme shown in the figure. To work with 1-wire interface there are ready-made library for the Arduino. 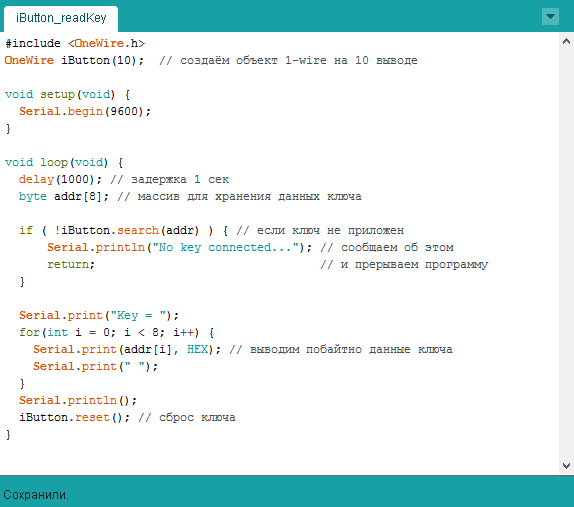 You can use like this: http://www.pjrc.com/teensy/arduino_libraries/OneWire.zip. Download the archive and extract the folder "libraries" folder of Arduino IDE. Now we can simply run the Protocol. 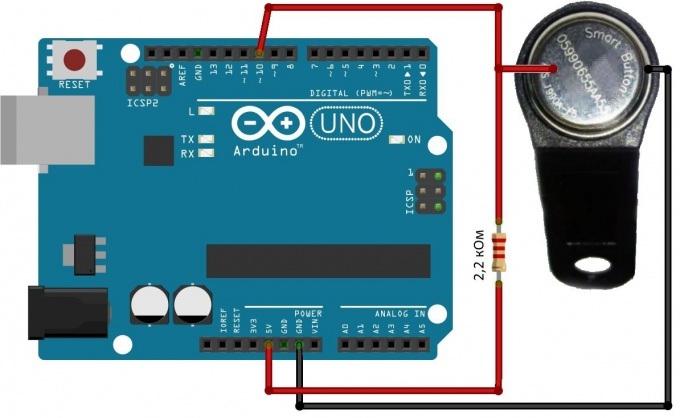 Download Arduino the standard way the sketch shown in the illustration. This sketch shows the key number for the intercom that is connected to the circuit. This is what we need now - we need to know the key number, a copy of which want to do. Connect the Arduino to the computer. Start monitor serial port: Tools -> Monitor serial port (or keyboard shortcut Ctrl + Shift + M). Now connect the key to the scheme. The port monitor will show the key number. Remember this room. Now rewrite the sketch so that he could record the data in the key memory. Code given in the illustration. 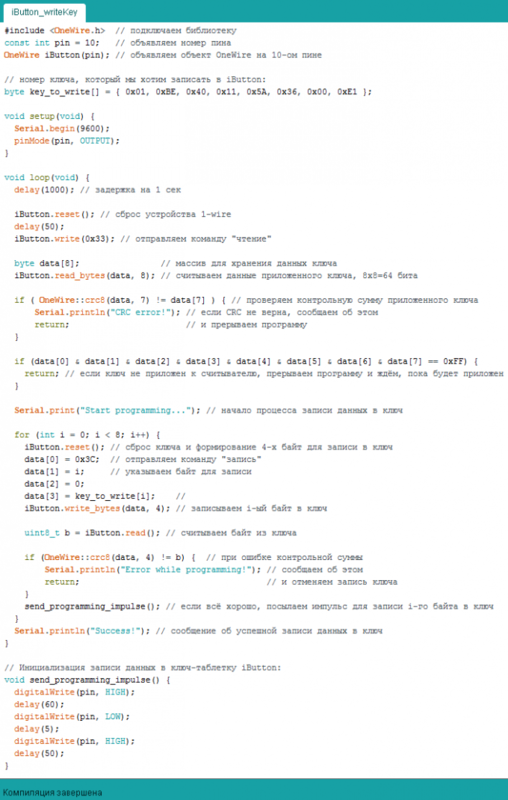 In the code given detailed comments. Most importantly, do not forget to specify the number of your original key in the array key_to_writethat you learned earlier. Upload this sketch to Arduino. Open the monitor serial port. Connect to the schema key to be a clone of the original key. The result of programming the serial port monitor will display an appropriate message. 2) If while compiling you get error "class OneWire has no member named read_bytes" or similar, then find another library OneWire, the Internet is a lot of them. Keys for intercom come in different types and families. This code will not work for all keys, but only for RW1990 or RW1990.2. The programming key may result in key risks. Given the desire, it is possible to rewrite the program for different type of key. For this you need to find a description for Your key (datasheet) and correct the code of the sketch according to the description. In life a situation may arise when you need fast enough to make a key by impression. In order to do this operation, first we must know what, how and in what sequence should do. Then you need to stock up on various necessities and patience. 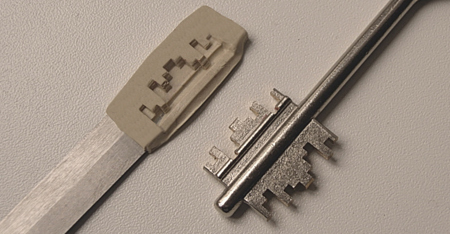 The cast, needle file, blank keys (for beginners it is better to have on hand three or four pieces, the rest will be enough for two), a sheet of paper, a pencil, a ruler might be useful to the plaster and PVA glue. So, on the table lies a finished mold. In principle, it doesn't matter what material it is made, the main thing - that it was clear and consistent. Line methodically measure all dimensions of the cast, without missing a beat (ideally should be reflected even accidental dents). Data transfer on a sheet of paper. After draw a drawing. It needs to be not approximate but as accurate as possible and competent. Once on the table will be drawing, you are ready to run the main stage. As already mentioned, you must have at least two preset format that matches the original keyof Ohm. Carefully saw out the needle files all bends the keyand, observing the dimensions. In any case not to hurry, and leave sharp edges. Even if the original was any burrs, it does not mean that they must also migrate to the duplicate. A duplicate is always to enter the castle harder than the original, and therefore the line should be rounded. But in any case not to overdo it, otherwise you can easily ruin the workpiece by cutting away only a fraction of a millimeter. Actually, this key in the snapshot is ready. Plaster and PVA can be useful, their use turns out not hollow, and the reverse of the existing cast. Solution of gypsum with glue, pour the first cast, when the time required for solidification of the solution, swipe all those stages that have already been listed.